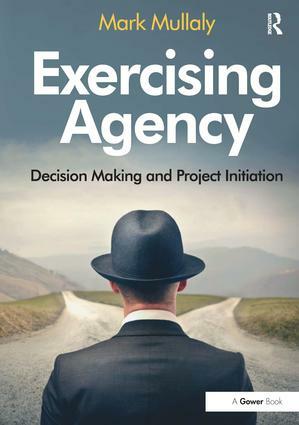 Exercising Agency is a book about decision making. In particular, it looks in detail at how a very important type of organizational decision gets made: whether or not to initiate a project. Making strategic decisions of this kind can never be a wholly rational and scientific process. And Exercising Agency lifts the lid on many of the important behavioural factors that inform project decisions: power and politics, personality, the ’rules’ of an organization. Mark Mullaly draws on his research to provide practical guidance for decision makers; project shapers, approving executives and those responsible for how initiation decisions are made. By explaining the influence, value and risks associated with the elements that inform the way we make strategic decisions he will help you identify how individuals and organizations can best support the process to ensure project initiation decisions are effective and most closely underpin the priorities of the organization. If you are involved in framing or making decisions about the future of your organization; the projects that you do or don’t decide to initiate, then read this book. It won’t make the decisions any easier but it will help you improve the quality of the decisions you make and over time, the effectiveness of your organizational decision making. Mark Mullaly founded Interthink Consulting in 1990 as a company dedicated to helping organizations to develop strategy, execute projects and manage strategic change more effectively. Mark is a senior management consultant with over 25 years of experience. Mark works with private and public sector organizations to develop effective strategic plans, make strategic decisions and solve complex and uncertain problems. Mark has been a pioneer in the development of organizational project management capabilities. He developed the first maturity model for PM in 1993, and launched a worldwide benchmarking effort to evaluate organizational PM practices in 1997. In 2004, Mark became one of the co-lead investigators of the research effort ’Understanding the Value of Project Management’, sponsored by the Project Management Institute. This study remains the largest and most comprehensive research effort undertaken in the field of project management. Mark was awarded a PhD by Bond University in Gold Coast, Australia.